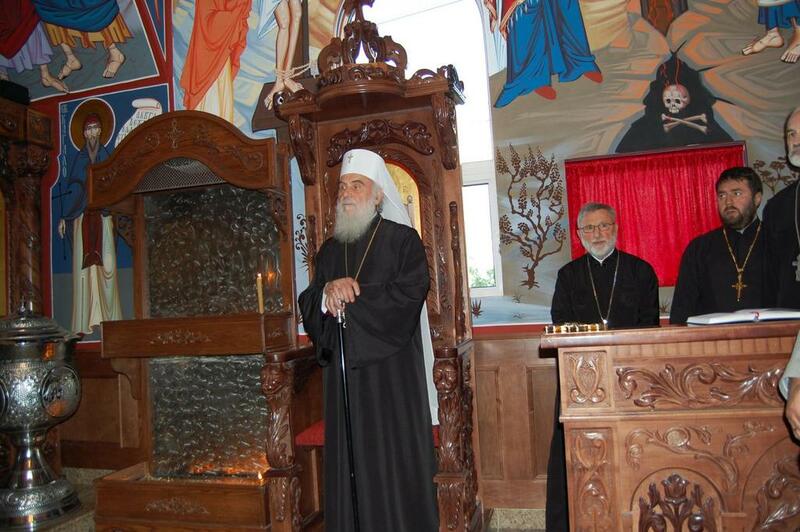 Edmonton, Alberta - His Holiness Serbian Patriarch Irinej, administrator of the Diocese of Canada, visited the northern most Serbian community, the St. Sava parish in Edmonton, on Frida and Saturday, June 12-13, 2015. 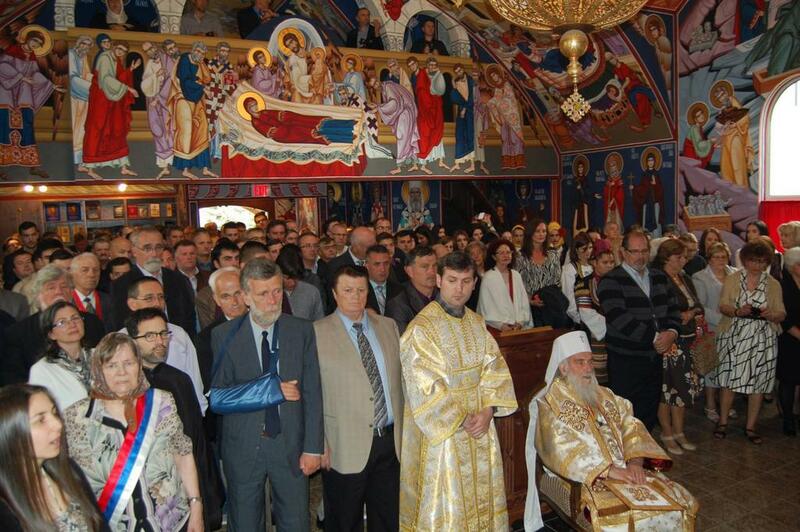 This is Patriarch's first visit to the city of Edmonton and the Province of Alberta. Clergy and faithful welcomed His Holiness Serbian Patriarch Irinej, administrator of the Diocese of Canada, at the airport in Edmonton on Friday, June 12. 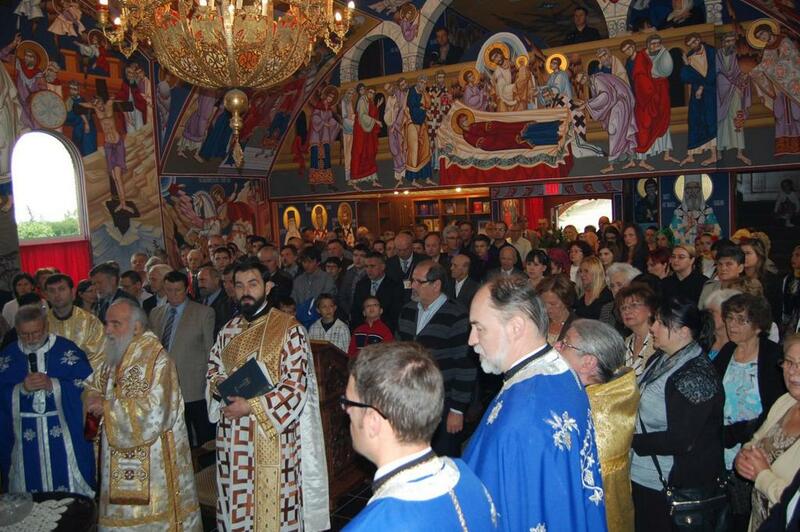 Accompanying the patriarch were: V. Rev. 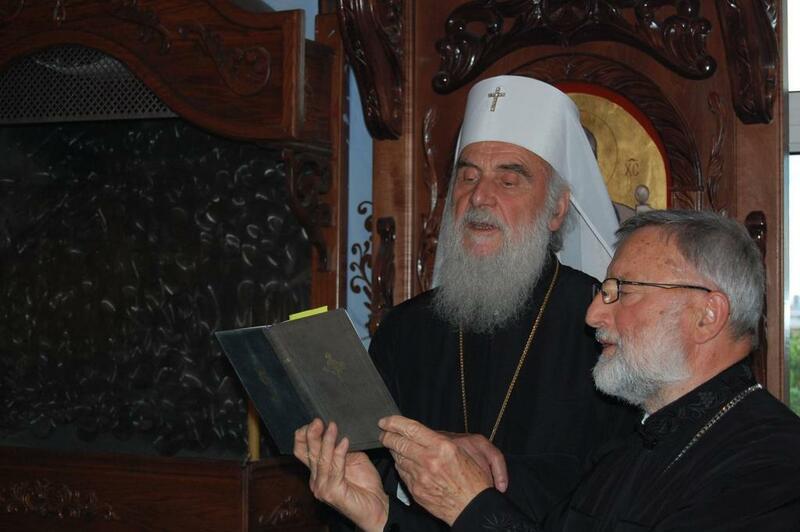 Stavrophor Vasilije Tomic, Protodeacon Damjan Bozic and Milan Lesic. Serbian children, donned in traditional folk dress, awaited His Holiness with flowers and the customary bread and salt at this unique and magnificent welcome. 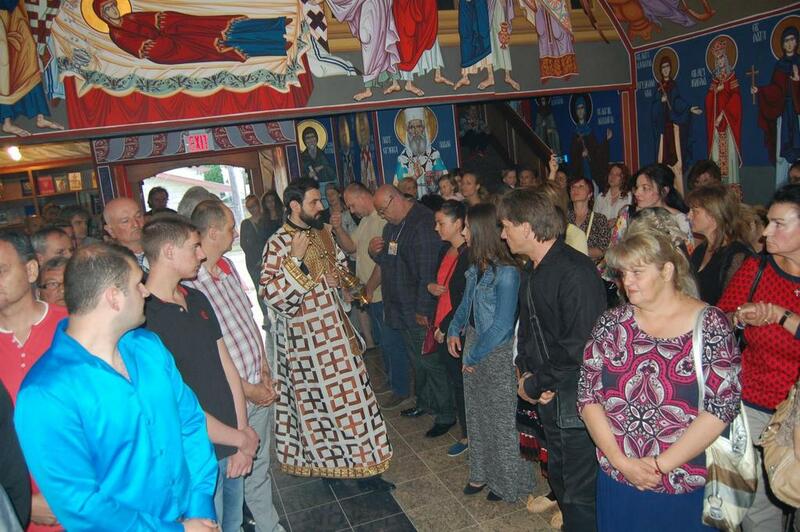 The faithful, joyous at the patriarch's visit, approached him to receive the blessing from their Spiritual Father. Welcoming His Holiness was the parish priest V. Rev. Desimir Vidovic, together with Episcopal Dean V. Rev. 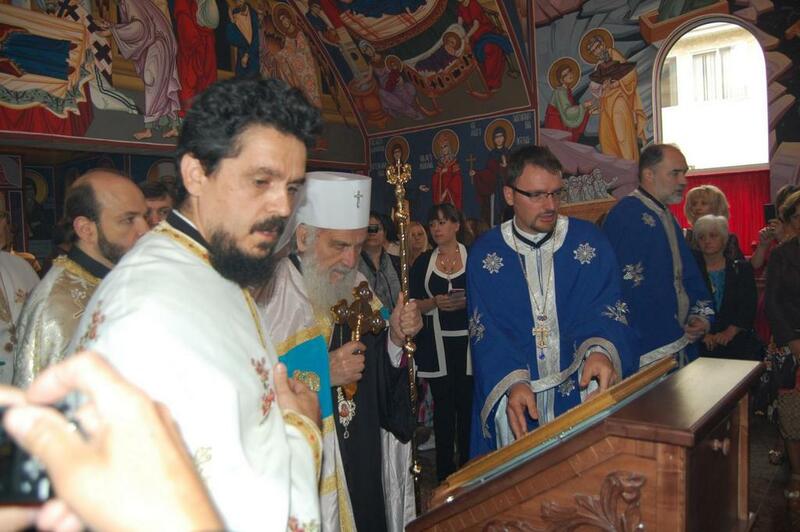 Stavrophor Obrad Filipovic, V. Rev. 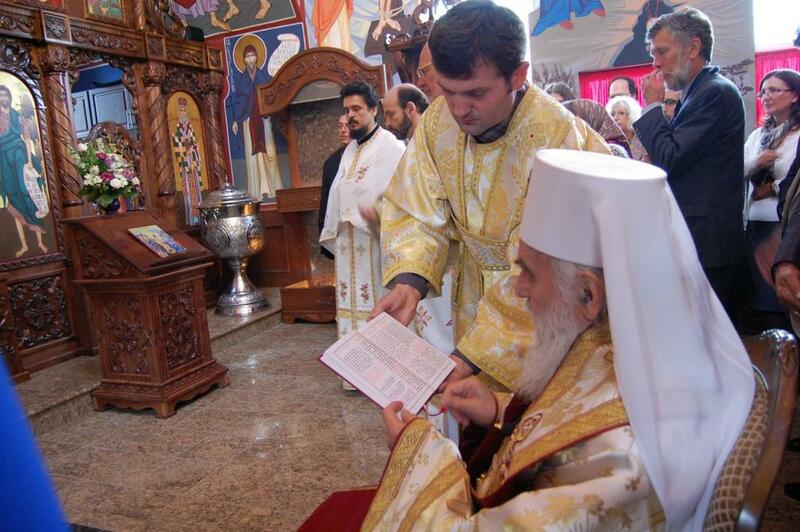 Stavrophor Dragomir Ninkovic, and V. Rev. Stavrophor Radovan Maric. The patriarch greeted everyone with a few words. 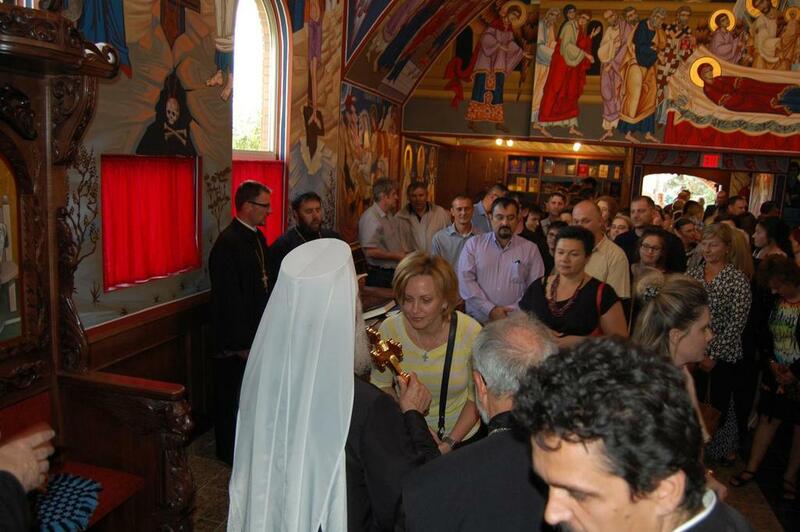 Afterwards, Vespers was seved at the overfilled St. Sava Church, served by V. Rev. Desimir Vidovic who greeted the patriarch with words of welcome. The Patriarch greeted everyone, thanking them for the warm welcome. 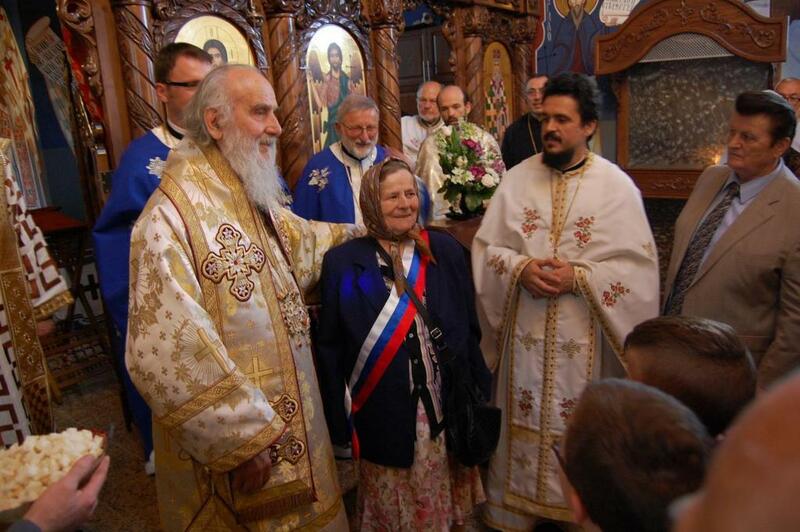 After Vespers the Patriarch visited students of the Serbian school and folklore group "Opanak". On Saturday, June 13, before the beginning of the Holy Hierarchical Liturgy, His Holiness blessed the completed frescoes in the St. Sava Church. 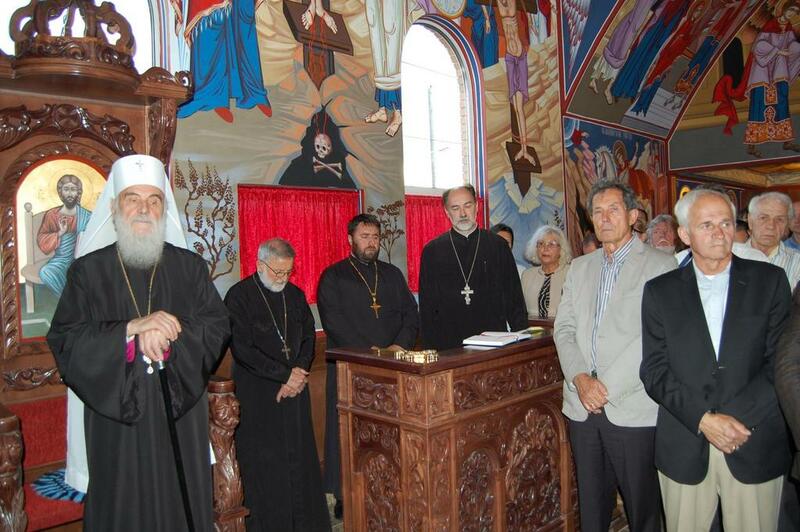 Iconographers who worked on the frescoes were: Dragan Marunic, Nemanja Marunic and Dragan Stankovic. Kuma for the fresco work was Rosa Banovic, member of this church school congregation since its founding. 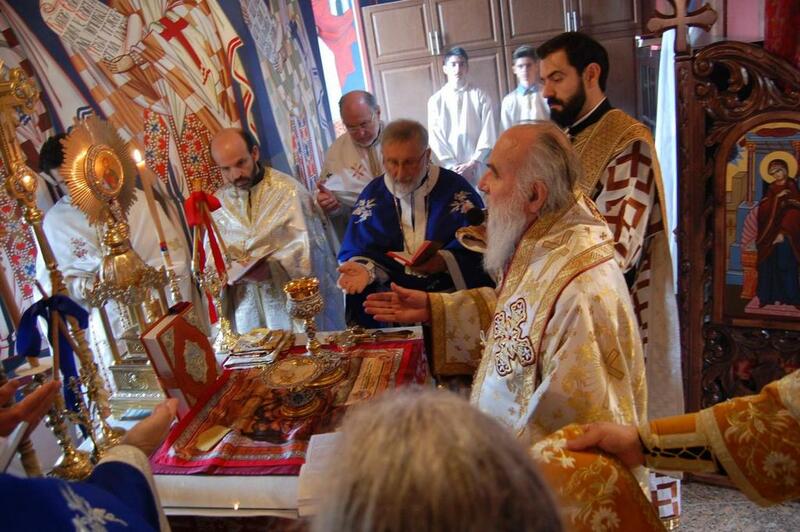 The holy hierarchical Divine Liturgy began after the blessing, with His Holiness officiating and the concelebration of: V. Rev. Stavrophor Vasilije Tomic, V. Rev. Desimir Vidovic, V. Rev. Stavrophor Dragomir Ninkovic, former priest in Edmonton and currently in Kitchener, Episcopal Dean V. Rev. 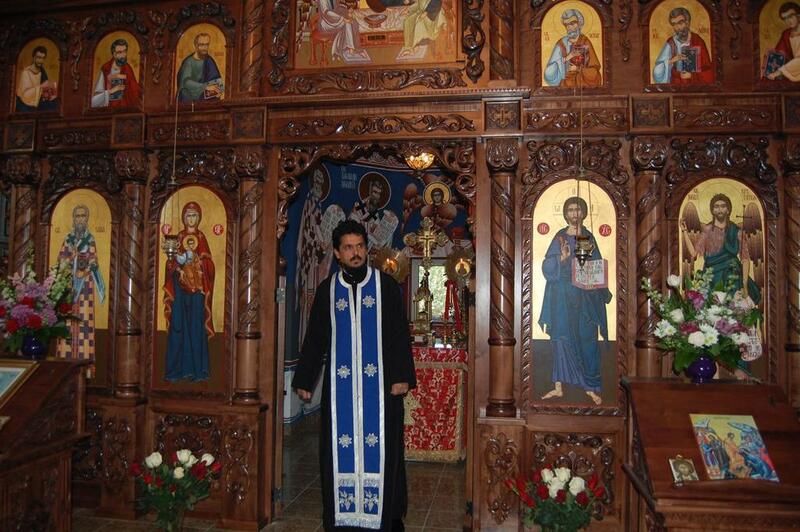 Stavrophor Obrad Filipovic from Calgary, V. Rev. 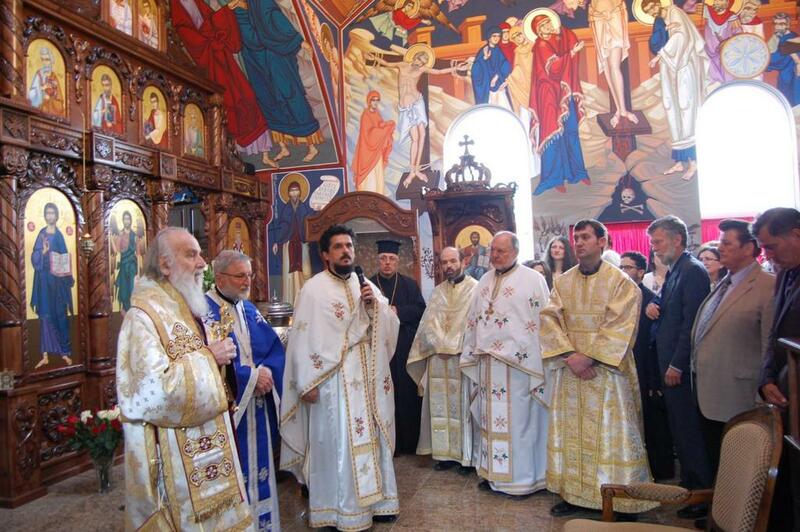 Stavrophor Radovan Maric from Regina, Protodeacon Damjan Bozic, Archimandrite Philip Speranza (OCA), Fr. 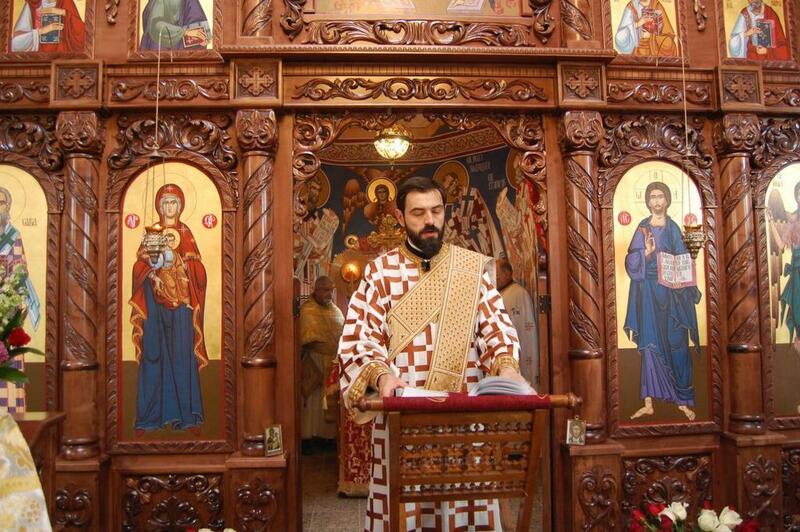 John Kaoukakis (Greek Orthodox Church), Fr. 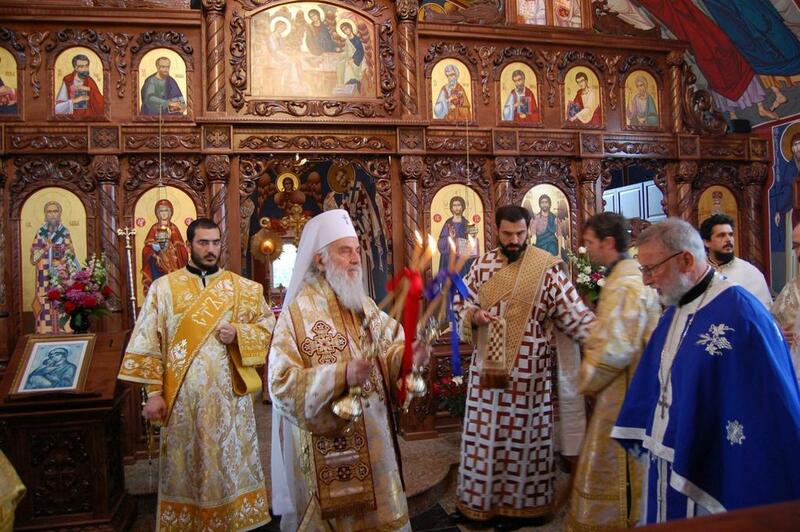 Mircea Panciuk (Romanian Orthodox Church), and Protodeacon Jesse Isaac (OCA) and Subdeacon Nenad Vojvodic. 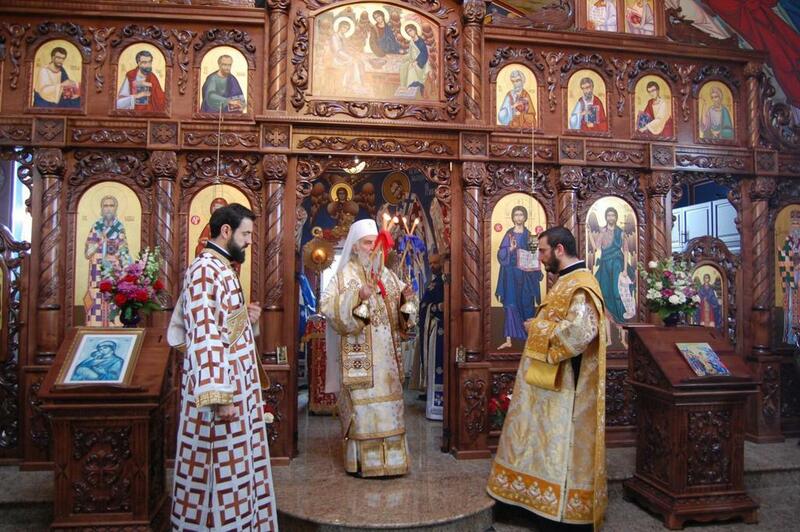 Following the Divine Liturgy, His Holiness awared the parish priest the right to bear a cross. In his homily His Holiness spoke to the faithful of perserving their faith, of regularly coming to church. In life we all have many temptations with which we must fight as soldiers of Christ. A formal banquet was prepared after liturgy at the Ramada Hotel where the host, Milan Mrdjenovic, accommodated everyone. The meal was prepared by our hard working Circle of Serbian Sisters, 'Kosovska Devojka' from Edmonton. Speaking during the program were: V. Rev. Stavrophor Desimir Vidovic, parish priest, Savo Bozickovic, president of the church board, Dusan and Jelena Savic of the Serbian-Canadian Cultural Society. His Holiness addressed everyone in a very warm and instructive address. Nejdo Leka greeted His Holiness and all present with a folk toast. Taking part in the program was also the Serbian folklore group "Opanak" from Edmonton, students of the Jovan Jovanovic Zmaj Serbian school and the Actor's Society from Edmonton. Leading the program were Zeljko Sulaver and Jasmina Boskovic-Nikic.